The US subsidiary of Innovative Technology will represent the company at the upcoming Amusement Expo International, to be held at the Las Vegas Convention Center, March 27-28. 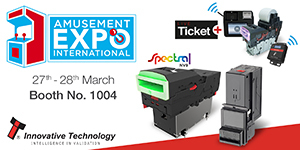 The US office will show its range of bill validators and TITO system at its booth number 1004. Rebecca White, vice president of sales and business development at the US company said: “This is our fourth year at AEI and we are looking forward to showing visitors our US TITO system – Live Ticket. This low-cost microhub and android desktop TITO redemption terminal. It can scan, print and read barcoded tickets to maximise revenues, eliminate fraudulent tickets and increase machine up-time and total play time. Following some successful installations in Wisconsin, we are looking forward to expanding this out to the wider North American marketplace soon.